Click on these thumbnails to see full-size screenshots of the Bfast app. A nice little home for your daily dealings. 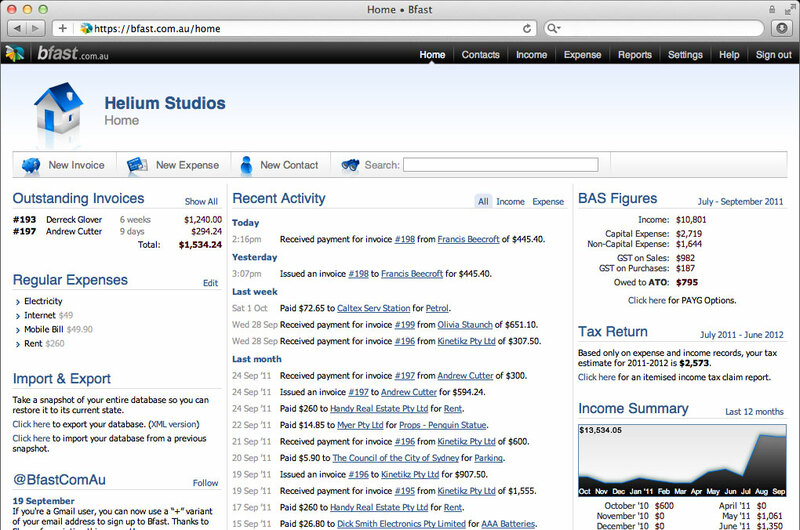 See your outstanding invoices, recent activity, last BAS figures and more as soon as you sign in. 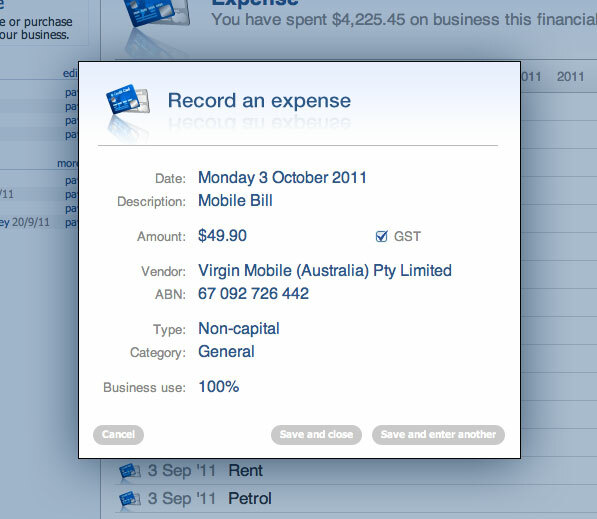 Record expenses and issue invoices right from the home screen. Search for anything right on the home screen. 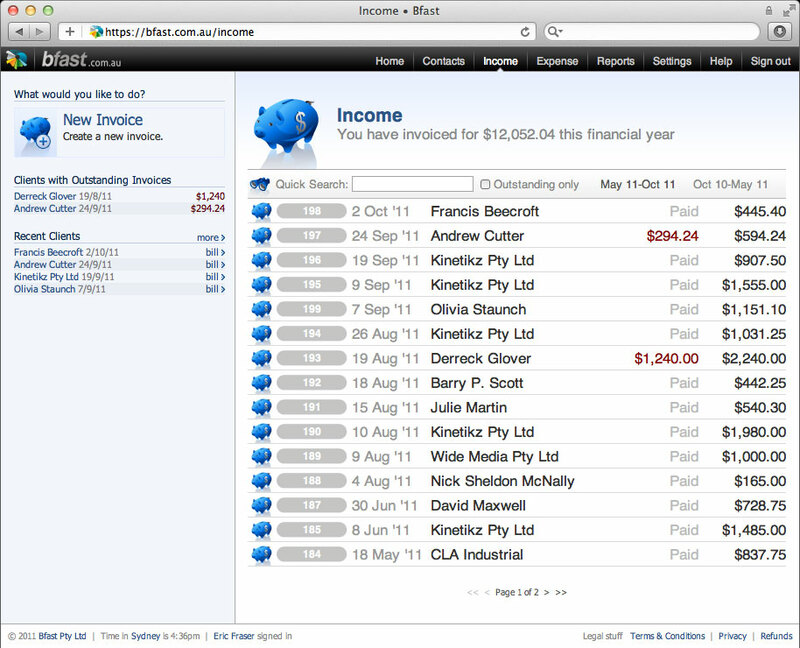 Bfast recognises names, dates and prices and displays relevant contacts, expenses, invoices and payments as you type. Everybody likes a good graph. They make you feel so business-ish. This handy home-page gadget also provides some valuable perspective into your earning trends and spending habits. 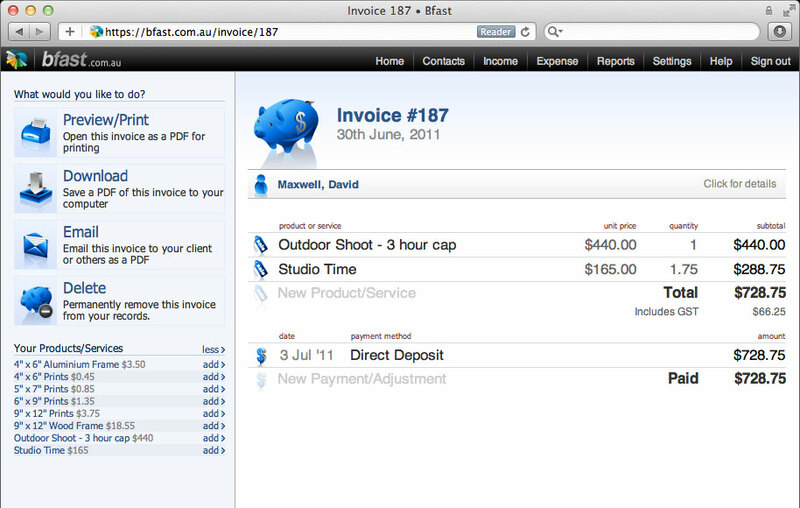 Create and send invoices in seconds. 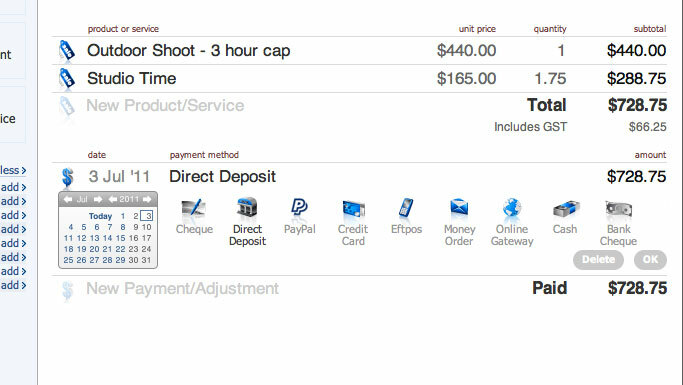 Bfast employs a simple point-and-click interface for creating invoices. 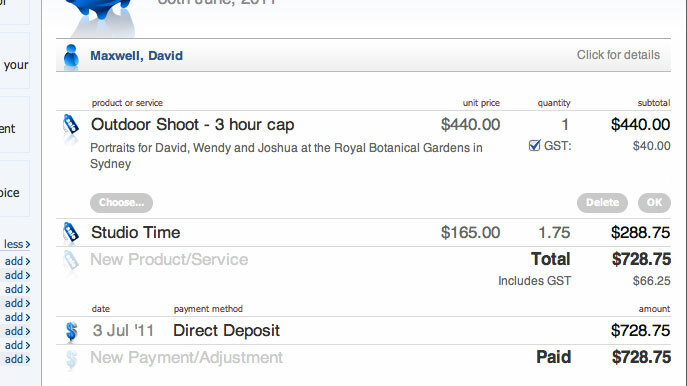 Add line items with descriptions, unit prices and quantities, and email them with a single click. 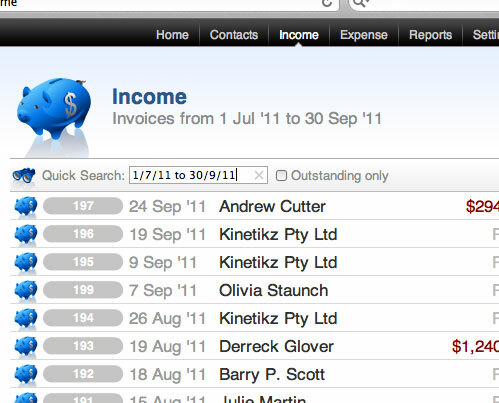 Manage client details directly from your invoices. Start typing a name, company name or A.B.N. and watch as Bfast fills in the blanks for you. 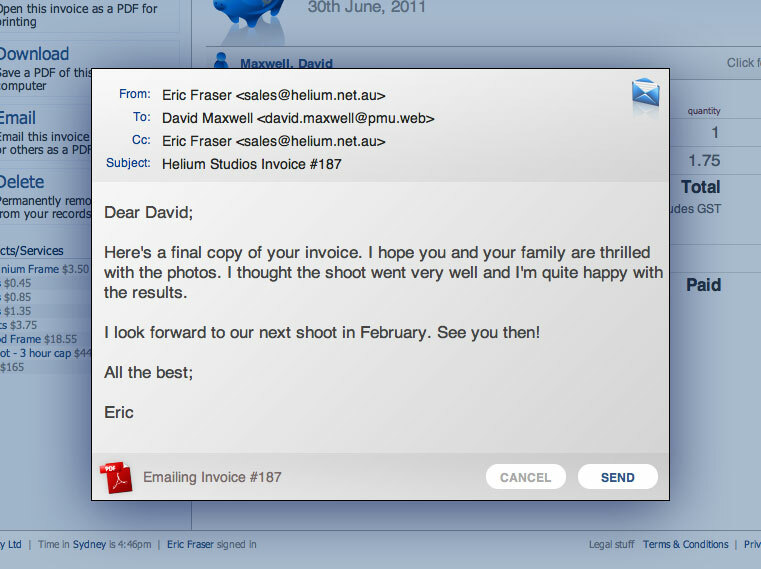 Send your invoices as PDFs with a single click. Cc them to yourself or your accountant. 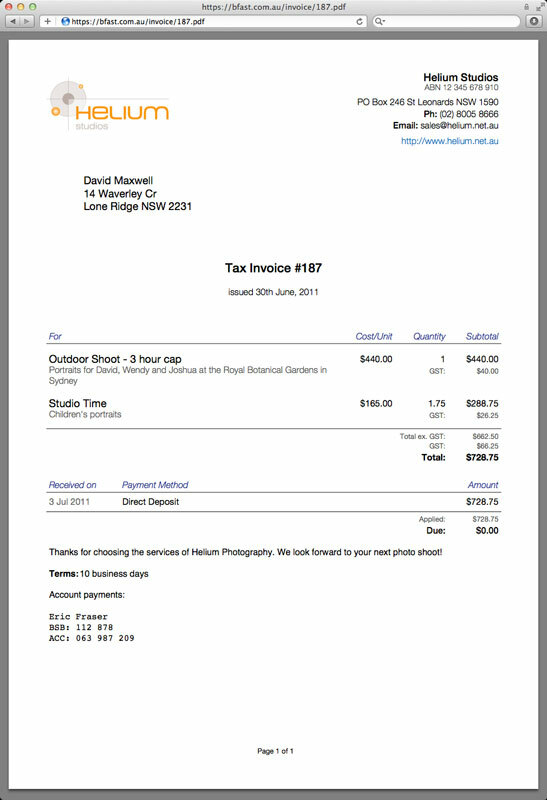 View, download and email clean, modern-looking invoices as PDF documents. Include your logo, contact details and footnotes to really stand out and look schmick. Fine-tune each line item with an additional “long” description, turn GST on or off for each line item, and have GST and subtotal calculated as you type. Record how and when you receive each payment with a simple graphical interface. 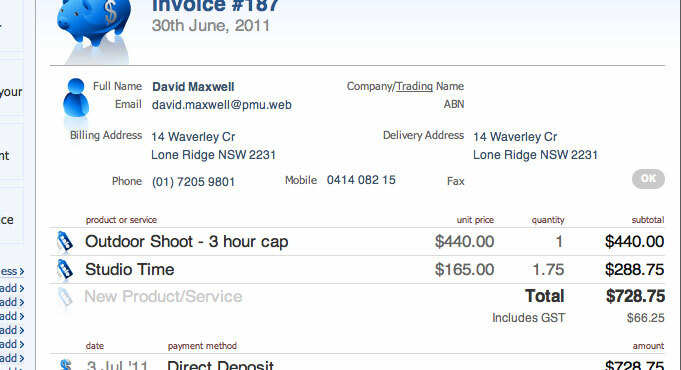 See the invoice balance calculated in real time. Get your GST and PAYG cash back the easy way. Tracking expenses is a snip with Bfast’s super-clever expense tracker. 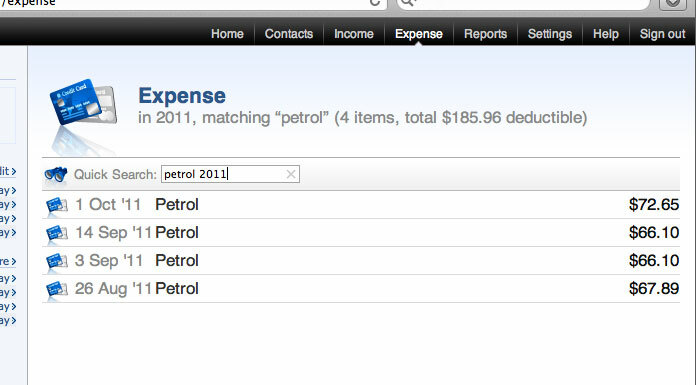 This simple form remembers your recent expenses and offers suggestions as you type. 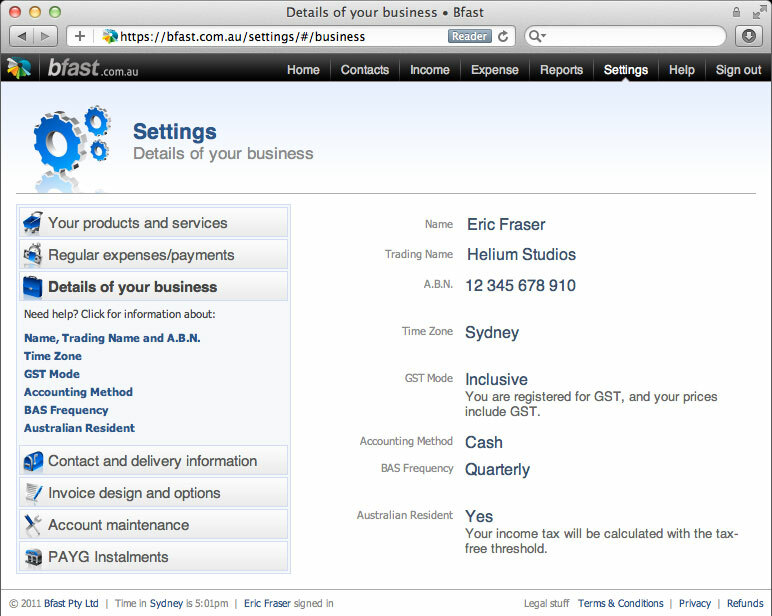 It also looks up Australian businesses using their ABNs, so you don’t even have to type their names. 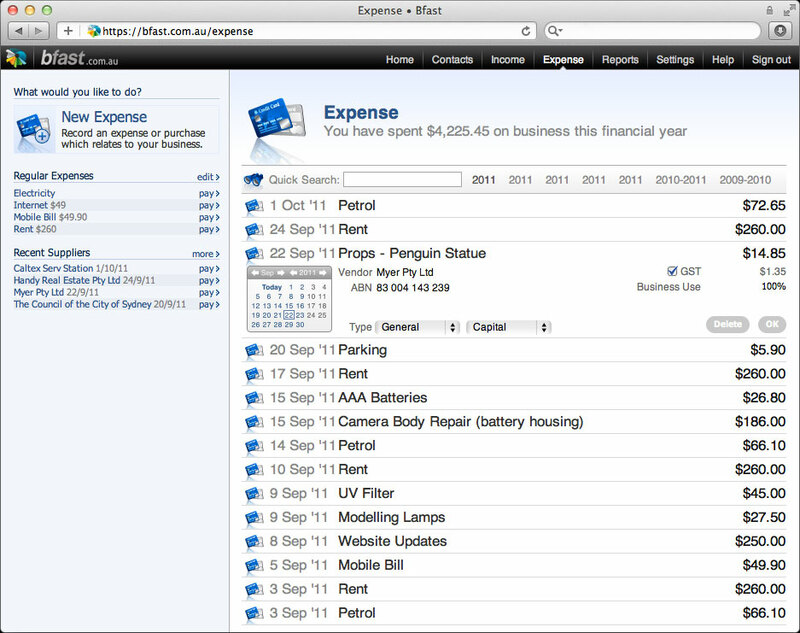 See your entire expense history in a great-looking list view. Make corrections with the unique inline editor without even leaving the list. Bfast provides the fastest, easiest way imaginable to refer to old expense records. Bfast’s intelligent search technology recognises names, dates and amounts, allowing you to pinpoint exactly what you’re looking for with the bare minimum of effort. See search results as you type. Manage your invoices like a pro. Browse or search through your entire invoice history in style. 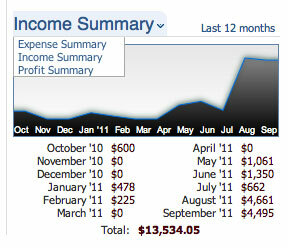 Bfast provides a great-looking overview of your earning history. 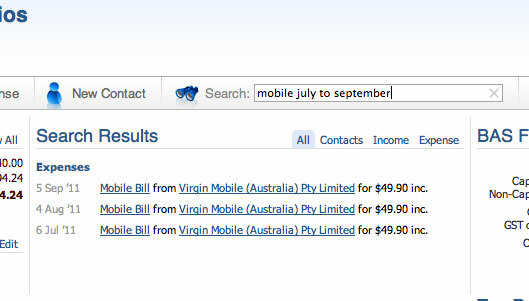 See who owes you money just by ticking the “Outstanding only” box on your income page. You’ll also see a total for all outstandings at the top of the page. We think that’s all kinds of handy. Bfast’s invoice search feature recognises names, amounts, invoice numbers, single dates or date ranges, making it a very powerful tool for looking up your invoice history. See search results as you type. Add as many categories and products/services to your catalogue as you like, then add them to invoices without typing a single keystroke. Bfast was made just for Aussies. 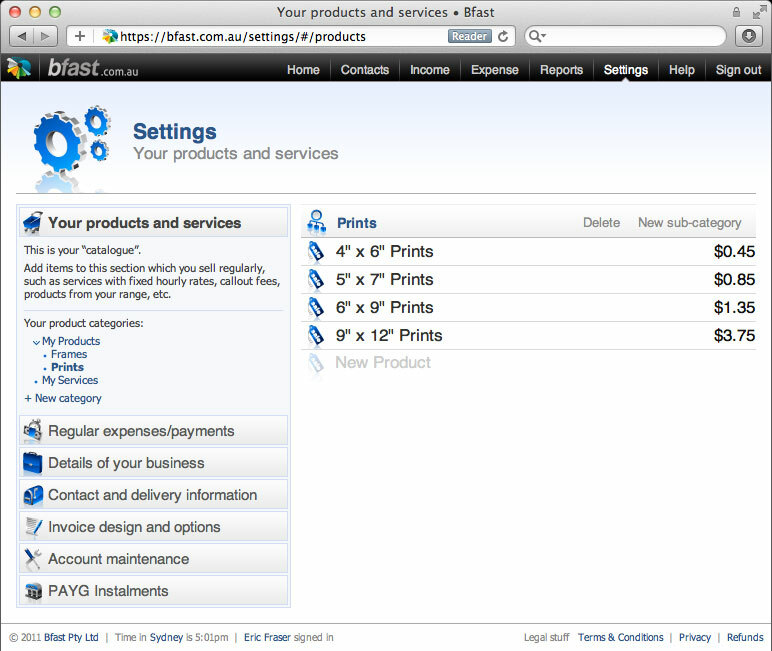 Customise the way your business operates so Bfast can provide just the services you need. 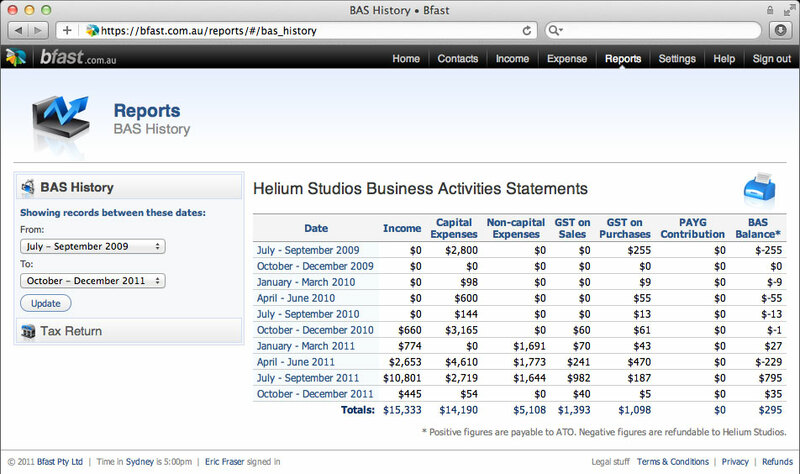 Review your BAS history or generate a detailed end-of-financial-year report with just a few clicks. Become your accountant’s favourite client by giving them everything they need in a single document. … and we're back. Have a good evening!